You may have to do some creative maneuvering to get into the starting position if the victim and their kayak are separated. 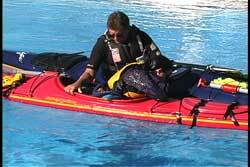 A cowtail or a deck sling provides you with a way to get the kayak to the victim or visa versa. See USK article, "Using A Deck Sling." Once I have the victim in their cockpit and their body close to the their kayak, I roll their kayak upright. The techniques for rolling a kayak upright are the same as when you perform the "Hand of God Rescue". See USK article, "Hand of God Rescue/Recovery". As I mentioned earlier, this rescue gets easier if their are more rescuers available. However, if you have more than one rescuer, then you need to designate a lead rescuer to coordinate the entire rescue. The group needs to be in agreement as to what actions to take, but not at the expense of keeping the victim floating in the water. With a number of rescuers, you can even have one of the rescuers in the water with the victim (assuming the rescuer is dressed for long immersion time). That rescuer in the water can help keep the victim face up and provide support and stabilization. 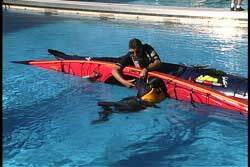 They can also help guide the victim into the kayak and help roll the kayak upright. 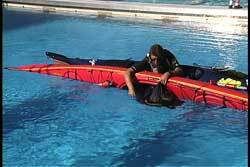 Of course, securing that rescuer's kayak on a tether is necessary so their kayak doesn't drift away. 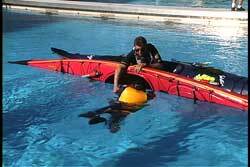 The original positioning of the kayaks can be a factor in what you plan to do after the kayak is righted. Your first consideration is to get the victim in their kayak and the kayak righted. If you can only accomplish this rescue in one specific boat orientation, then you will have to use that position. 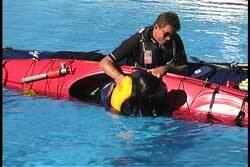 If you can learn to be efficient at performing the rescue regardless of the boat orientation, then you should consider what final orientation you need once the victim's kayak is righted. 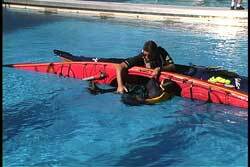 If you had to wait for the help you called, what boat orientation would be best for you to stabilize the victim's kayak and still help and monitor the victim? I started this article by saying, "I hope this never happens to you", because the scoop rescue and the implications of having to perform one can be very challenging. I find training for this rescue very rewarding with respect to skill development, coordination and communication. I suggest you first practice it one on one. Then try it two on one. Then, three on one. 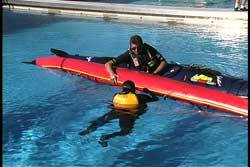 Also try it with one rescuer in the water. Then I suggest you take the next step after the victim is upright, which is setting up for the tow and then towing to see if your system works. I will add, that the use of "Sea Wings" can give the one on one or the group more options for towing. See USK article "Sea Wings Recoveries And Uses."